As a piece of comedy, it is excellent. As a horror film, it fails completely, and I mean completely. However, as a piece of comedy, this film is excellent. For instance, there is a dream-within-a-dream sequence that missed the mark so spectacularly that I burst out laughing in utter shock. 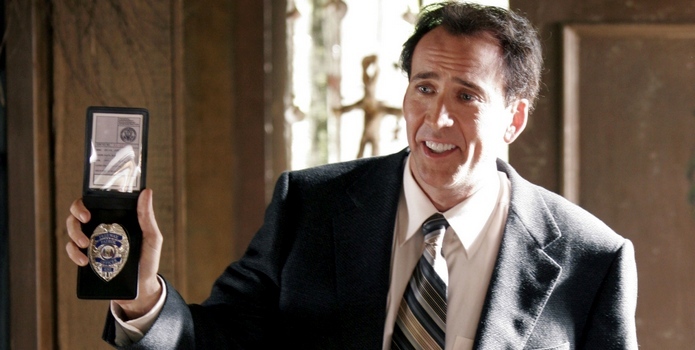 Funnier than that however is Nicolas Cage, whose lines ‘How’d it get burned? !’, ‘What’s in the bag, a shark or something?’ and ‘Oh no! Not the bees! Aghhhh!’ deserve to be in the AFI Top 100 Quotes thanks mainly to Cage’s, shall we say, ‘Cageseque’ delivery. The terrific script is laced with unintentionally funny lines, another notable moment being when Cage turns the acquiring of a bicycle into a serious police procedure – *draws gun* “Step away from the bike.” Merely quoting these lines here does not do them justice, you have to see it to appreciate it. As you may know, the film’s direction was so markedly ill-judged that the aforementioned scenes have now become legendary in the online community. Cage’s battles with the maddeningly brainwashed women of Summersisle are also a joy to watch, as there are no holds barred when things get physical. Cage lays down the law with a combination of thundering punches to the face, kicks to the chest and stern Cagesque shouting, and there are times where he does all of this whilst dressed as a grizzly bear. I suspect my enjoyment of the film was significantly compounded by the HD copy that I watched, so I would recommend that, as the filming locations are quite pretty. Overall I think this film is firmly within the ‘so bad it’s good’ category, it’s impossible to take it seriously – it really is entertainingly poor.